Jango Fett - a ruthless mercenary. A limited edition of 95 pieces, hand-numbered and signed by the artist! Measures 28-inches wide x 14-inches tall! No mercenary in the Star Wars universe is as ruthless and stalwart of a killer as Jango Fett. 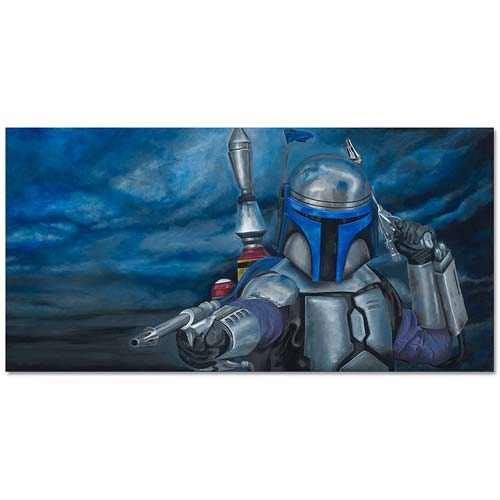 This Star Wars Jango Fett Merciless Canvas Giclee Print pays homage to the Mandalorian's chutzpah and features an image of Jango Fett, blasters in hand and aimed directly at his next kill. Measuring 28-inches wide x 14-inches tall and printed on canvas, this beautiful piece of artwork has been hand-numbered and signed by the artist, Greg Lipton. A limited edition of 95 pieces, this fantastic giclee print even comes with a certificate of authenticity.